Day 3!!! Sorry ya’ll missed yesterday. The merry elves had their first party last night. They’ve been totally stoked about the list of Rainbow Award winners, so we had to send Tucker out for more supplies today. Don’t worry. We figured we’d have to make a couple of runs this year, because it seems the parties just get bigger and wilder up in here so we always plan accordingly. 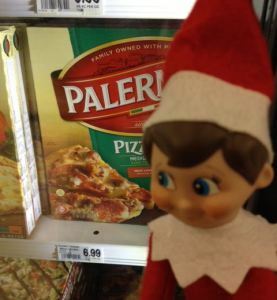 Tucker the merry elf is doing some comparison shopping on supplies. Speaking of…congratulations to all the Rainbow Award winners and runners-up this year! Rock on, YOU!